Microsoft® has made massive inroads into the cloud with Office 365™. For a while, it looked like Microsoft would lose the cloud productivity platform battle to G Suite™. Google® got a head start and raced ahead to have millions of businesses using its cloud-based productivity suite, directly competing with Microsoft Office. Then, Microsoft delivered Office 365. At first, it was a confusing strategy, and enterprises weren’t sure how to react. As time marched on, not only did organizations become more comfortable with the cloud, but Microsoft also made significant progress with making Office 365 a more natural progression from the existing Office suite. Now Office 365 is Microsoft’s fastest growing commercial product ever. Despite this progress, a major issue remains for IT admins. 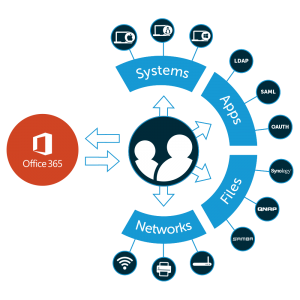 How do they integrate Office 365 into their identity management strategy? Many organizations are leveraging Microsoft Active Directory. Here’s something to consider: if organizations are moving their infrastructure to the cloud with Office 365, why would they want their directory services platform to remain on-premises? Microsoft announced a cloud-based directory service called Azure Active Directory. Unfortunately, that’s only helpful for infrastructure at Azure (including O365). As a result, IT organizations that have moved to O365 are now in a difficult position. How, exactly, do they centralize their user management now? There is a cloud-based directory services solution that seamlessly integrates with O365. Directory-as-a-Service® specifically has as one of its use cases the integration with Office 365. This means that the unified cloud directory can provision and sync identities to O365. As a central cloud-based directory, an organization’s identities are stored within the platform. Those identities can be leveraged for all of a user’s IT resources, including their systems, applications, and networks. 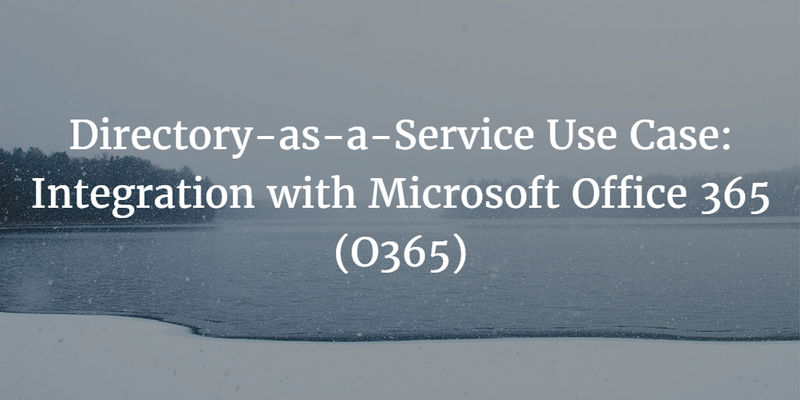 Most notably, an identity within Directory-as-a-Service can be provisioned to Office 365. If Office 365 exists before the decision is made to use Directory-as-a-Service, those users can be easily synced to the cloud directory. Those users are then stored within the cloud directory and then federated to whatever an IT admin wants, including a Mac® device, servers at AWS®, on-prem LDAP-based applications, and even the WiFi network. The core identity that is used throughout the organization can now be used for Office 365. For end users, this is a significant step-up because the user account that they need to access just about everything effectively is their user O365 credentials. The benefit for IT admins is that they can have a central user management system without any systems on-prem. More specifically, legacy directory services aren’t required, making Active Directory and OpenLDAP obsolete. Directory-as-a-Service becomes the integrated directory services platform that seamlessly controls Office 365. Drop us a note to learn more about the Directory-as-a-Service use case of integration with Office 365. We’d be happy to walk you through how it all works. Alternatively, feel free to sign-up for a free account. Your first 10 users are free forever.